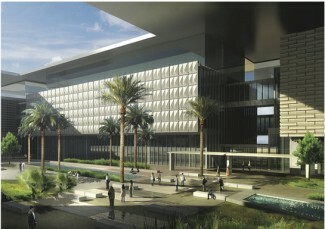 King Abdullah University of Science and Technology (KAUST) near Jeddah, Saudi Arabia, combines several planning and design elements that meet under the theme of sustainability. The University’s new campus was constructed from scratch on a 22-mile (36km) stretch of desert 50 miles (80km) north of Jeddah along the Red Sea. The campus is part of a larger master plan which includes a new town of 10,000 to 12,000 people that surrounds and supports the University. 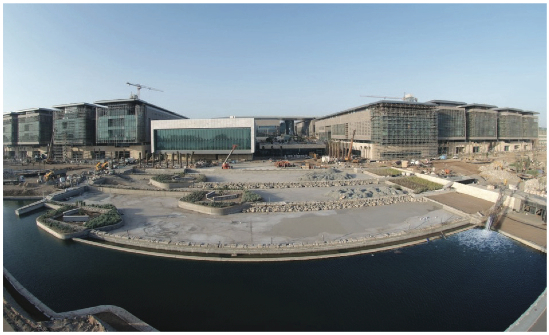 KAUST was designed to propel the Kingdom into the 21st century with modern teaching facilities and equipment costing US$1.5 billion. The University’s mission is to advance science and technology to new levels by educating tomorrow’s leaders while catalyzing the diversification of the Saudi economy and addressing challenges of regional and global significance. All campus buildings meet the strict ASHRAE 55 Standards for thermal and environmental requirements for human occupancy, guaranteeing that interior temperatures and humidity will remain at comfortable levels. Xylem’s Bell & Gossett brand VSX® pumps help meet the campus’ HVAC needs that result from the extreme climate in the region as well as from some very demanding system challenges. After meeting and surpassing a long list of application requirements – including a minimum specification for 80% efficiency – Bell & Gossett Series VSX double-suction, split-case pumps were selected for district cooling at the University campus. The requirements also set strict guidelines for Net Positive Suction Head (NPSH), and identified limited space areas that required small pump footprints. 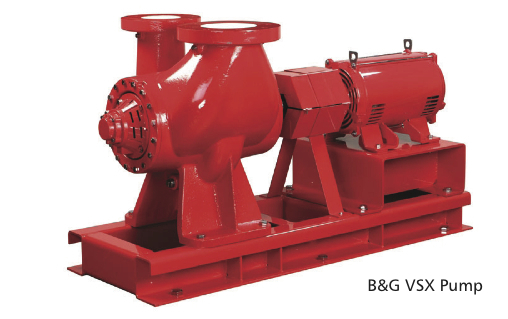 VSX pumps were chosen because of their proven vertical split-case (VSC) platform that features vertical suction and discharge flanges that reduce equipment footprint by up to 40% compared to horizontal double-suction and large inline pumps. As a result of its revolutionary design, the VSX platform offers many installation options. Using CFD technology, VSX delivers identical performance in any of its three flange configurations. The result: users can maximize piping possibilities and meet a broad hydraulic range for chillers, towers, distributive and general pumping requirements. Coordinating the design and installation of the KAUST HVAC system was a team effort between Xylem and its Bell & Gossett Representative in Saudi Arabia who worked to supply specialized drawings, weekly progress and production schedules, vibration monitoring and compliance with sometimes unfamiliar industrial specifications. The massive project started in the Fall of 2006, and was finished in just three years. To achieve this ambitious timetable, planning groups accelerated the process with a “Racing the Sun” design in which HVAC professionals from ten offices across multiple time zones contributed to the planning effort during just one 24-hour period. KAUST’s first class of 400 students was selected from many parts of the world well before the University’s official opening on Sept. 23, 2009. The University’s president, Professor Choon Fong Shih, described the institution as the opportunity of a generation. “We give our academics the full freedom to pursue exceptional science. We fund them to work together in groups of men and women developing ideas that will make a big impact,” he said. Thanks to Xylem, its Bell & Gossett VSX pumps helped King Abdullah University of Science and Technology meet its requirement for 80% efficiency pumps, as well as solve problems involving limited space and other installation challenges. As a result, KAUST students study in a comfortable environment, and the University is able to achieve its mission to advance science and technology to new levels in the region.